Offshore oil and gas exploration has become increasingly prominent over the past several years. But, questions remain about how effective response efforts would be if there’s an oil spill. Last fall, scientists began tackling one piece of the puzzle — tracking how spilled oil would move and spread in the Arctic Ocean. 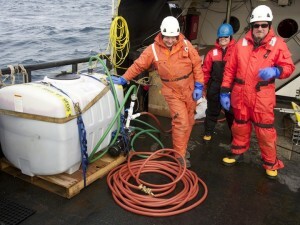 The Arctic Tracer Release Experiment – or ARCTREX – is a step toward understanding how oil – or other contaminants – would spread in the ocean. The team couldn’t release oil into the water, so they used a red-colored dye instead. “It’s a non-toxic, kind of like a food dye that you use for cupcakes,” Peter Winsor, an associate professor of oceanography at the University of Alaska Fairbanks, said. 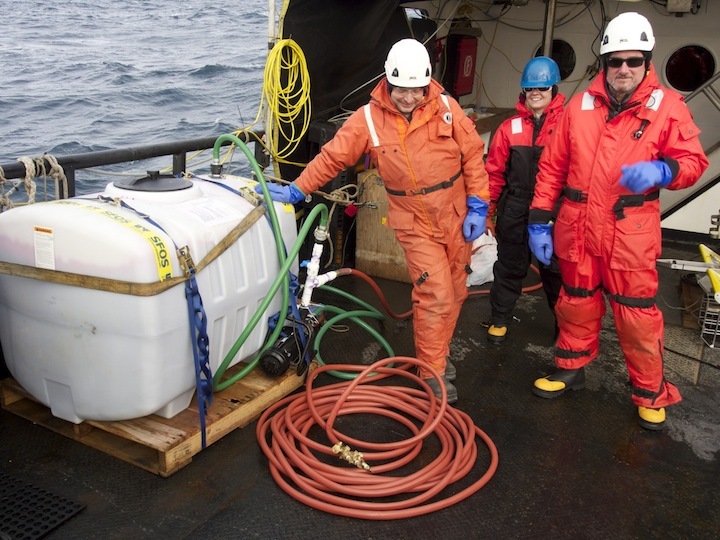 He says the goal of the experiment wasn’t necessarily to mimic crude oil, but instead to better understand how the ocean could disperse any number of substances underwater. The team released dye on the surface of the ocean in two different locations in September, when the edge of the Arctic sea ice is still far to the north. 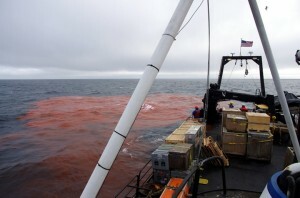 The first batch of dye was deployed at the Berger lease patch, about 60 miles off Alaska’s northwest coast in the Chukchi Sea. Winsor says this release proved the crew could successfully track the dye and relay the data in near-real time to NOAA’s Office of Response and Restoration – where it could be mapped online. The crew tracked the dye for about four days before moving onto the next location, a little closer to Wainwright. The second release was much closer to the coast and near a large front — where there’s a big difference in temperature and salinity across a very short distance…and Winsor says the dye there tracked much differently. The team used three methods to track the dye: a pump system on the ship to get measurements at the surface; a small vehicle towed behind the ship to gather data further below; and with autonomous underwater vehicles, which are about 5 feet long and weigh 110 pounds. Winsor describes them as large, yellow bananas with wings – and they use an unconventional propulsion method. Winsor says that efficiency coupled with the ability to program them via satellite means they could prove to be a valuable tool in tracking spills, even without a support vessel in the area. Though this is a good first step, Winsor says the data is specific to this type of area and wouldn’t be a good representation of a place with deeper water like the Gulf of Mexico. “This is a very different ocean; it’s 40-50 meters deep – only a shallow Arctic shelf sea that’s very dominated by wind and hydrographic properties and water coming up through the Bering Strait,” he said. Winsor says he plans to take a team out to the same areas next year and release dye at the bottom of the sea to simulate what could happen if an Arctic oil well blows out.